The air, thick and heavy in the valley of Motomiya City, is weighing down on me as I walk up the steep hill. Toshitake Nakamura, the presenter who organized the Trinity Irish Dance tour in Japan, silently leads us toward a row of tiny gray houses, each with a small square yard in front containing a mini-garden patch. From the concrete path at the bottom of the hill, they look like a row of sheds that might house machinery or animals. Not people. These houses were built by the Japanese government to provide shelter for victims of the 8.9 magnitude earthquake that shook Japan in March of 2011. The disaster caused a state of emergency at a nuclear power plant in nearby Fukushima, and people were ordered to evacuate the area. 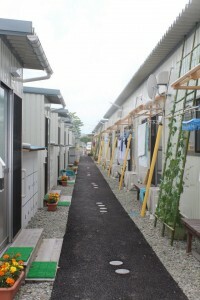 Many lost everything: their homes, families, money and took refuge in these meager houses in Motomiya City. Toshi, as we affectionately call him, leads our group to the first of the houses. A small metal door swings open and Toshi introduces our group to the smiling, wrinkled face of a survivor of the earthquake. The man eagerly ushers us into his home, turning the seemingly cold space into a warm, welcoming one. Following Japanese custom, we take off our shoes and sit down on the tatami mats covering his floor. The man begins speaking rapidly in Japanese, waving his hands as he looks each of us in the eye. Toshi translates, explaining that this man and all of his neighbors will be coming to our show, and that he is so grateful that we have come to perform for them. That afternoon at the workshop before our performance I tightly clasped the hand of a short, energetic Japanese man. He and I spoke not a word of the same language, yet were able to build a relationship by dancing together. â€œDum dum dee di li dee dum,â€ we hummed together as the drums thundered a steady beat. As the residents of Motomiya City jumped up and down, squealing and imitating our every step, I thought to myself that I had never seen such a grateful and responsive group of people before. That night, as I applied my eye shadow before the show, I looked up from my mirror to glance out the window. I saw hundreds of refugees of Motomiya City walking down the hill together to the concert hall. These were the same people we had taught at the workshop earlier that afternoon. I had come to Japan as a professional Irish dancer, on a three-week tour of the country. Toshi had planned for us to spend our day off holding a workshop for the people of Motomiya City and performing a free show for them. As complete strangers to the damaged community, none of us knew what to expect. When my plane landed in Tokyo, I should have been a foreigner in a strange land.Â But the Japanese people welcomed me into their country, and extended kindness like I had never experienced before. I didn’t feel like an outsider. It was ten minutes before the call to take our places and I stood in my usual place in the pre-show circle, hand in hand with my fellow dancers, fingers gripped tightly together, our anticipation and energy creating a palpable hum. 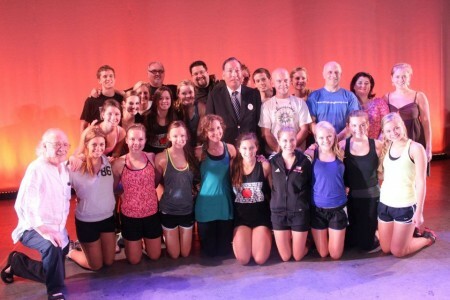 The mayor of Motomiya City came backstage to express his gratitude to us for coming to the city to perform. He described the rough year that his city had experienced, and was brought to tears by our presence in the city and the excitement we brought. He told us that his people needed something to be happy about again, and we were just the cure. As the curtains rose on the stage, I felt like I was part of the Motomiya family. After the show, we stood outside the doors to greet our audience. My face quickly became sore because I couldnâ€™t stop smiling as I held rosy-cheeked babies, hugged old women and high-fived children. One woman, whom I will never forget, took my hand and placed it over her heart. This small gesture meant more then any amount of words could. As my hand rested over her heart, I did not need to speak Japanese to understand her gratitude, her happiness and the depth of the hardship she had endured. I realized that although I was the one physically touching her heart, she had touched my heart indescribably. The corners of her eyes wrinkled as she smiled and nodded, looking deep into my own eyes. She squeezed my hand between her smooth, creased hands and turned and disappeared into the crowd. She left so quickly. Once our audience had gone, Toshi asked for our cast and crew to gather at the front of the hall. We all sat down in the red velvet seats of the theater, massaging our aching feet while we waited for the soft-spoken Toshi to begin. Toshi began by telling us how the earthquake and tsunami affected his own life. His sisterâ€™s house had been destroyed. He then pulled out a bag full of small boxes wrapped in brightly colored tissue paper. He explained that the owner of the theater wanted to give us gifts to thank us for coming to Motomiya to perform. Inside the delicately wrapped boxes was a keychain made of a special native tree, meant to bring good fortune to the wearer, a pin with the townâ€™s mascot on it, and a small towel featuring another Japanese good luck charm. Toshi wiped tears from his eyes as he told us that the people of the audience had also given us money because they enjoyed our performance so much. Upon the sight of a pile of Japanese Yen, we all began tearing up. How could these people who had suffered so much be so generous to us? How could they give us money and gifts when they had lost nearly everything they had? Only then, as I sat clutching my gift, with warm tears running down my face, did I feel alien. This level of kindness was unfamiliar to me. Their generosity overwhelmed me, and I found myself struggling to fathom their goodness. The odd uneasiness I felt because of their generosity was jarring. I had entered Motomiya City as the giver, donating my time to bring happiness to the community by sharing my dancing. I could not have been more wrong. I woke up that morning thinking that my dancing would brighten a community in desperate need of joy, but went to bed that night knowing that the people of Motomiya City had done more for me. I left Motomiya City with a box of mementos and an unexpected gift: an extremely personal encounter with generosity.